Darren Criss is a talented, and now award-winning, singer and actor who first made a splash as Blaine, the lead vocalist of the Dalton Academy Warblers on the TV series “Glee.” After getting his BFA at University of Michigan, Criss made his Chicago connection with StarKid’s Productions, producing and portraying the title character in “A Very [Harry] Potter Musical.” He landed on “Glee” in 2010, and through his connection to producer Ryan Murphy (“Glee” and “American Crime Story”), portrayed Andrew Cunanan in 2017’s “The Assassination of Gianni Versace,” for which he took home a 2018 Emmy on Monday (9/17) for Outstanding Lead Actor in a Limited Series or Movie. Michigan Avenue Magazine is Chicago’s “Modern Luxury” lifestyle publication, focusing on Home & Real Estate, People, Style & Beauty and Parties around and about the Windy City. It celebrated its 10th Anniversary in style, as Editor-in-Chief J.P. Anderson and President Dan Uslan welcomed cover star Darren Criss, actor Kyle McLachlan (“Twin Peaks”) and a host of Chicago’s glitterati to the festivities on the rooftop of The Marlowe, a new residence high-rise on Huron Street in the River North neighborhood. In a Podtalk with Patrick McDonald of HollywoodChicago.com, Darren Criss talks about his singer philosophies, his Chicago StarKid’s roots and his admiration for Disney tunes. 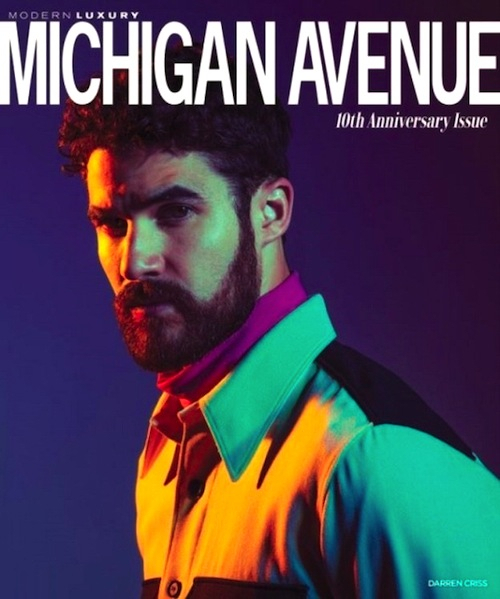 For more information about Michigan Avenue Magazine and its 10th Anniversary Issue, click here. For more information about The Marlowe, click here.